Below is a 5-question test on the circle. This test is linked to the lesson on the circle, which also has a test. 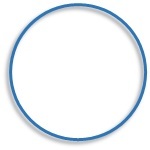 A circle is a shape containing a set of points that are all the same distance from its center.